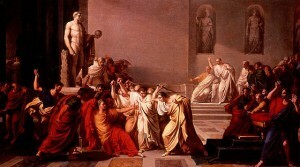 The Death of Julius Caesar,Vincenzo Camuccini (1771–1844). Friends, Romans, countrymen, lend me your ears! I come to bury Caesar, not to praise him. The evil that men do lives after them; the good is oft interred with their bones; so let it be with Caesar. The oration is masterful in that it cleverly turns the people against Brutus and Cassius by showing they were ambitious and not Caesar. By the end the plebeians call them traitors and murderers. In real life, it was much the same. Antony played them by seemingly supporting amnesty but turning people against them both. Brutus was forced to leave and ended up on Crete, Cassius went east to gather support among the governors and to amass an army. Antony and Octavian would clash militarily causing divisions in Rome. This allowed the forces of Brutus and Cassius to march on Rome. However Octavian made peace with Antony upon this news so both forces joined to stop Brutus and Cassius. They met at Philippi on 3 Oct 42 BC. The first battle resulted in Brutus defeating Octavian but Antony defeating Cassius. Not knowing that Brutus had defeated Octavian, Cassius took his own life. At the second battle of Philippi on 23 October, Brutus was defeated and forced to flee into the hills where he committed suicide. Antony treated his body with great respect by having it wrapped his most expensive purple mantle. His body was cremated and remains sent to his mother. In real life, it was much the same. Antony played them by seemingly supporting amnesty but turning people against them both. Brutus was forced to leave and ended up on Crete, Cassius went east to gather support amongst the governors and to amass an army. Antony and Octavian would clash militarily causing divisions in Rome. This allowed the forces of Brutus and Cassius to march on Rome. However Octavian made peace with Antony upon this news so both forces joined to stop Brutus and Cassius. They met at Philippi on 3 Oct 42 BC. The first battle resulted in Brutus defeating Octavian but Antony defeating Cassius. Not knowing that Brutus had defeated Octavian, Cassius took his own life. At the second battle of Philippi on 23 October, Brutus was defeated and forced to flee into the hills where he committed suicide. Antony treated his body with great respect by having it wrapped his most expensive purple mantle. His body was cremated and remains sent to his mother.